I am still enjoying playing with my new Lawn Fawn stamps. My other stamps probably feels neglected! Thank goodness they don't have feelings!!! **grin** I used my new set " Stay Tuned". I made a "washi tape" background for my radio image. I received a small Simon Says Stamp haul today - and started playing with my new washi tape, and this is what came of that!! I am trying new products that I haven't before - and like trying to challenge myself on what to do with those new things. 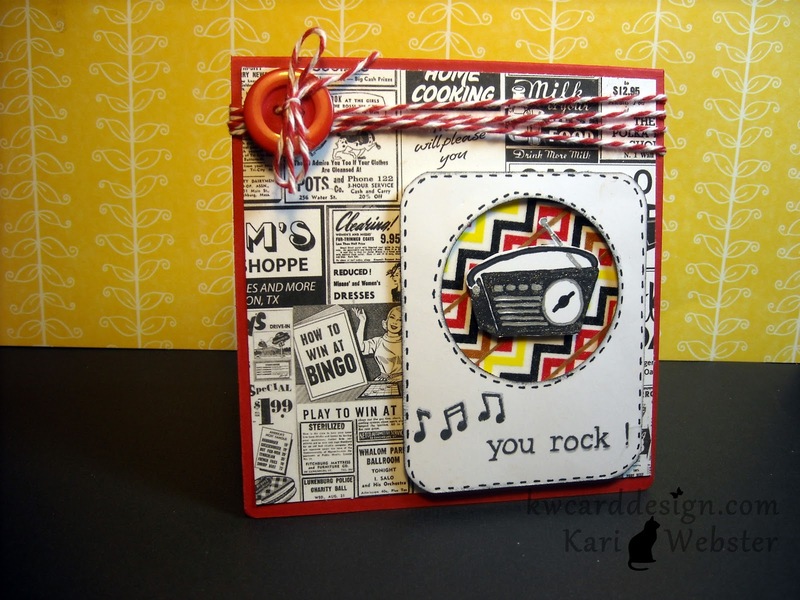 For the card base - is PTI Pure Poppy card stock, and patterned papers by Echo Park - Happy Days Collection. I love the retro feel of these papers!!! So much fun - and pleasing to MY eye at least! Not sure if you can tell - but I wanted to add a extra something to my radio - so I used a black Sukura glitter pen. Love these pens!! To finish the card off, I added some maraschino cherry bakers twine from The Twinery and a button from my stash. Hope everyone is having a great week so far!! I plan on finishing up my baby mini album project this weekend - and I will share that with all of you when that is complete. I will try and do a video for that - if not lots of pictures!! love this fun card. I really like how you have used the washi tape here too! I have not tried that yet! Great card! That Echo Park collection fits perfectly with the LF stamp set!